There was a school, which was administered by the Church with lay teachers. The first teachers being Mr & Mrs Marchand. 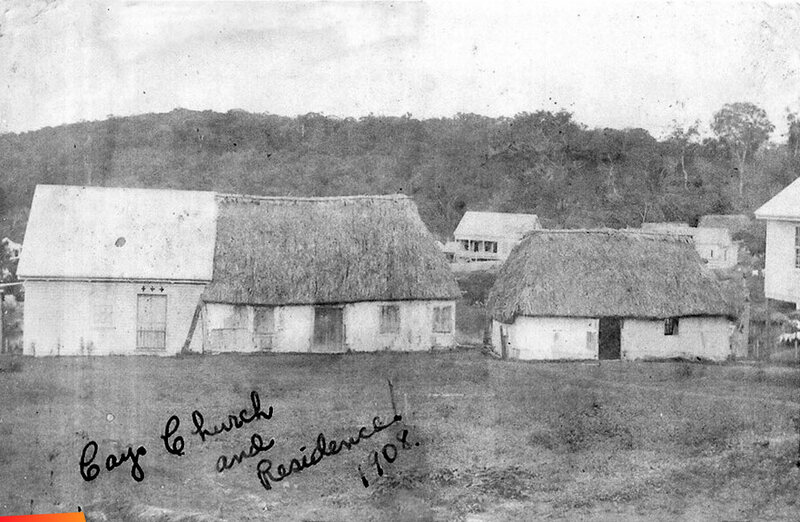 This Church and School were located on the right side going up to the present Sacred Heart Church. When I started school in 1934 they had built good wooden buildings including a convent for the Palotti Nuns. These are the lands donated to the Roman Catholic Church in San Ignacio in the early 1900's. - -This included the grounds where the Church, Convent, Schools and Prestbitery and towards Bullet Tree Road known as WAIGHT STREET. I also attended Sacred Heart school in the early 50s. I remember the royal palms leading to the church. Below was the old theater I use to watch Roy Rogers, his horse Trigger and Gene Autry movies. They could cover from grade 1 to 6 in this building. I remeber the old theater. Going to watch a scary movie then walking home at night Had to pass through the cemetary to get home on the other side. Well it was no walking it was running as fast as I could all the candles flickering on top of graves seeem as though they were following me. We lived at the Agriculture Station next to Arthur Mapp.